The new Korean movie, ‘Burning,’ is a thriller with layer upon layer of mystery. Well-known Korean actor Yoo Ah-in plays Jong-su, a recent university graduate who dreams of becoming a writer while working as a delivery boy. He runs into Hae-mi, played by newcomer Jun Jong-seo. Though he doesn’t recognize her right away, she insists they went to elementary school together and says she looks different because she’s had plastic surgery. They start becoming close but then Hae-mi heads off on a trip to Africa. She returns accompanied by Ben, a handsome, rich and mysterious young man who she’s met on her travels. Ben, played by Korean-American actor Steven Yeun, invites both of them to a meal at his elegant apartment--where the wary and literary-minded Jong-su points out to Hae-mi that her new friend Ben has a lot in common with the Great Gatsby--the fancy car, the expensive clothes, the opaque past. Not long after that, Hae-mi goes missing. 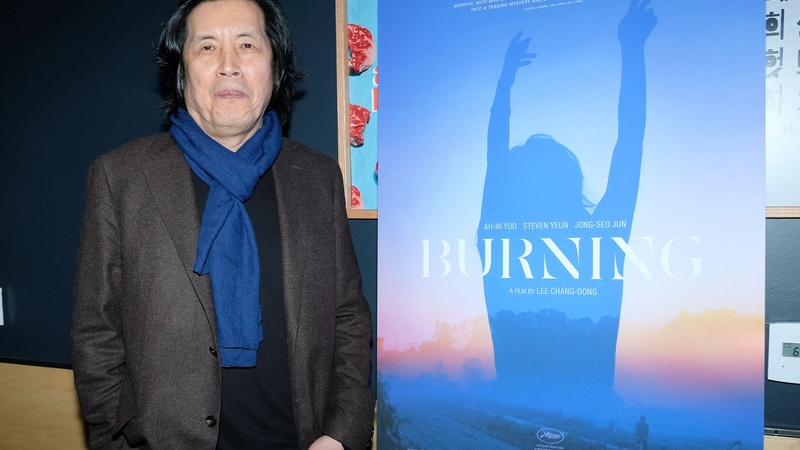 The director of ‘Burning’ is Lee Chang-dong, who before he started making acclaimed films in the late 1990’s, was an acclaimed novelist in Korea. ‘Burning’ is his sixth feature film. Director Lee tells us about the filmmaking culture of Korea, and how he made the move from author to director. He also explains why he felt Steven Yeun was perfect for the role of the Ben, a smooth-talking, well-to-do young man who may or may not be as friendly as he seems. Then, Yeun himself shares his experience of working with Director Lee on ‘Burning.’ Before playing the mysterious Ben, Yeun worked with another Korean director, Bong Joon-ho, on the Netflix film ‘Okja.’ But he played a Korean American in that role. In ‘Burning,’ Ben seems to be a native Korean. Having grown up in the States, Yeun had some work to do to get the dialog just right. Though Ben wouldn’t seem to have much in common with Yeun’s character in ‘The Walking Dead,’ Yeun says playing the zombie-fighting Glenn set him up perfectly for this most recent role.